DISTANCE FROM TOWN CENTRE: 5km, 5 minutes. Drive to the furthest car park following ‘Kaitoke Track’ signs. DEFINING CHARACTERISTICS: Run along well maintained bush track runs across the skyline ridge between Te Marua and Wellington’s Kaitoke Regional Park. Pass through stands of open beech forest offering brief views of Te Marua lakes and Upper Hutt Valley. Warning: This track offers magical photo opportunities when fine, especially early in the day, so if you take a camera-nut also take a whip. FEATURES OF INTEREST: At the furthest point explore the location of Rivendell of the ‘Lord of the Rings’ trilogy. 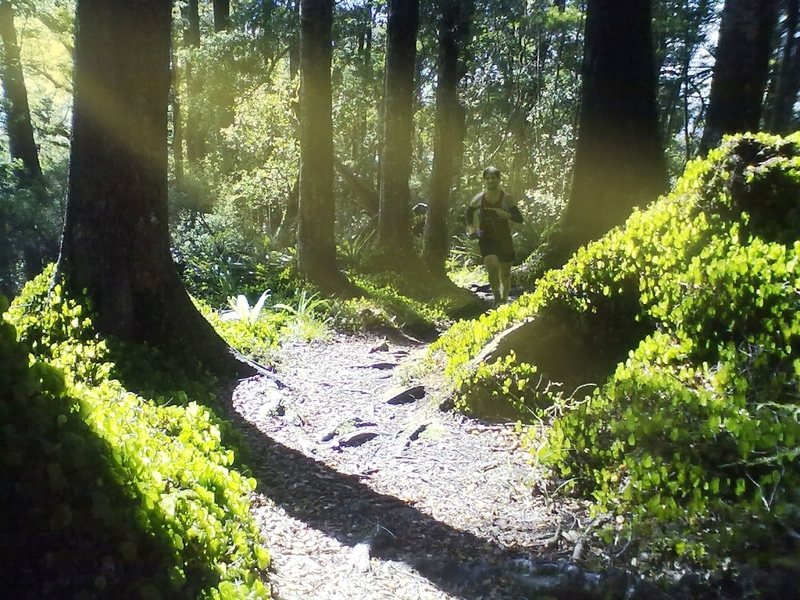 Kaitoke Ridge Track is well marked and easy to navigate but conditions underfoot vary depending on the weather. Expect vast boggy stretches of deep mud after rain but easy, well maintained bush tracks and good footing when dry. From the Te Marua entrance car park cross the footbridge and climb 150m through manuka and second growth bush. Watch for the short look-out diversion on your right near the top it’s worth the 50m detour. If mud is going to be an issue you’ll know it by now. This area was once logged but is now regenerating native bush. The main climb is over so enjoy the easy undulation as you breeze through dappled light and beech leaves strewn across a well-worn track. The whole ridgeline allows plenty of elbow room and is classic NZ bush trail. On a fine day the running is fast and fruitful. For the botanically minded: The dominant plant along the ridge is manuka and kamahi along with totara, rimu, hard beech and rewarewa. The plants are smaller along the ridge because of exposure to wind and cool temperatures. So are runners’ extremities so pack warm gear if the weather looks dodgy. The second lookout, ‘Tussock Knob’, has a tempting wooden bench overlooking wide scenic valleys and is an excellent spot for a snack or a rest, yeah right. Blatt into the next section and prepare to whip the camera-buff. When the sun streams through the canopy this is Middle Earth at its best, red beech forest on a steep, east facing slope. An open under-storey promotes swathes of moss and kidney fern across the forest floor. The steep descent to Rivendell and the Pakuratahi Forks car park is a good work-out for the quads through podocarp-broadleaved forest. Tall rimu and rata disappear through a canopy of kamahi, hinau and miro. But you are probably bombing down the track and won’t notice mahoe, pigeonwood, five-finger, horopito, pate and ferns. Once you hit tarseal on the flat, turn right and look for the open grass lawn which leads to Rivendell. If you enjoyed that you’re in luck, turn around and run back the way you came. The Blueberry Farm and Bakehouse. Head back towards Upper Hutt but hang a left after a couple of minutes at the Akatarawa Rd turn-off. 5 minutes on your left you’ll see the Blueberry Farm and organic Bakehouse. Coffee and desserts are available, as is their crystal clear swimming hole. They don’t mind sweat and they love to talk. Awesome work, cannot wait to head south… gives me a good excuse!